The New Brighton & Districts Historical Society and Museum Inc. 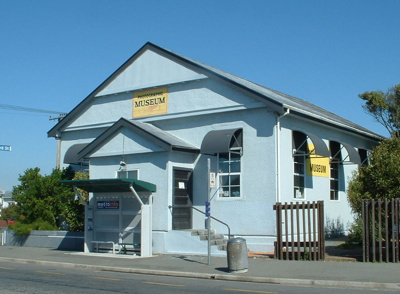 The Museum is housed in the old Saint Enochs Church which had it's centenary in 2013. The collection began with photographs only and expanded to include memorabilia of the area. There are many display boards of old photographs (currently undergoing updates) some memorabilia of bygone days of the old pier; the New Brighton Trotting Club; the Champion Surf Life Saving Clubs; the Bowls and Tennis Clubs and the Brass and Silver Bands. Items from a former well known shop in the area are displayed along with the Mayoral Chain when New Brighton was a Borough. Uniforms from the old New Brighton District High School; memorabilia and photographs from the local New Brighton Primary School and some 1974 Commonwealth Games clothing can be viewed. NB : Some long serving organisations, businesses and schools in the area have closed and a considerable amount of data, photographs and memorabilia has been given to the Museum to sort. The Secretary or The Treasurer, PO Box 18859, New Brighton 8641, Christchurch. 8 Hardy Street, New Brighton, Christchurch. Every day of the Week. Mondays open 10am -12 noon. Monday afternoons 1 - 3pm an Old Time Classic Movie is shown. All welcome for a cuppa and a biscuit beforehand for a donation of $2. Tuesday to Sunday 1 - 3pm or by prior arrangement. A donation into our donation box is welcome. Group/guided tours can be booked along with Devonshire Teas. The facility can be hired out to groups and a kitchen is available for use. Annual Membership is $10 per person and a quarterly Newsletter is sent to all current Members. A rack card/flyer with the opening hours, map of the site and details about us is available at reception including a list of the old time movies to be shown. A wheelchair is also available for use and some copies of photographs can be reproduced for a small fee. The Committee meets once a month with an AGM held June/July every year. -43.50891 172.72458 16 The New Brighton & Districts Historical Society and Museum Inc.
1884 "8 march 1914" "began school cadets" "bishop gw" "bowling club opening day new brighton" "brighton cricket" "buried in linwood cemetry" christchurch "christchurch new zealand" "cricket canterbury" "david conrad hamilton" "david and conrad hamilton" "early homes of new brighton 1884" "flipper ball machine" "g w bishop scout master" "hamilton family home of new brighton" "hamilton family of new brighton" "hat box metal" "headmaster new brighton school 18891926" "horse trough" "m l edwards trainer driver" "maori refreshment rooms sign" "mr and mrs enoch hamilton" "mrs elsie kimber" "new brighton" "new brighton bowling club" "new brighton cricket" "new brighton cricket club" "new brighton hotel" "new brighton scout master" "new brighton scout troupe 1918" "new brighton scouts" "new brighton surf life saving" "new zealand" nz "old christchurch pier" "old pier" "old pier penny arcade machine" "old private hot salt water pools sign" pattersons "penny arcade machine" "pin ball machine" "public transport new brighton" "public transport to new brighton" "racing colours" "seaview road" "surf life saving" "the gw bishop memorial swimming pool" "the new brighton surf life saving club" "trotting colours"